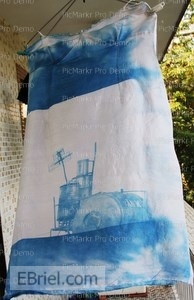 Cyanotype Photos on fabric and artists proofs on papers. The Cyanotype prints are of the unnoticed, overlooked details essential to the bridge's character, like paw-prints on concrete; vegetable crates scattered at the market below; and an essential tire pump waiting at the bridge's edge. Final versions were blueprinted onto clothing as a tribute to the thousands who live and work around the Long Bien bridge today, and displayed on the bridge itself for the 2008 Long Bien Festival, organized by the Maison des Arts, Hanoi.